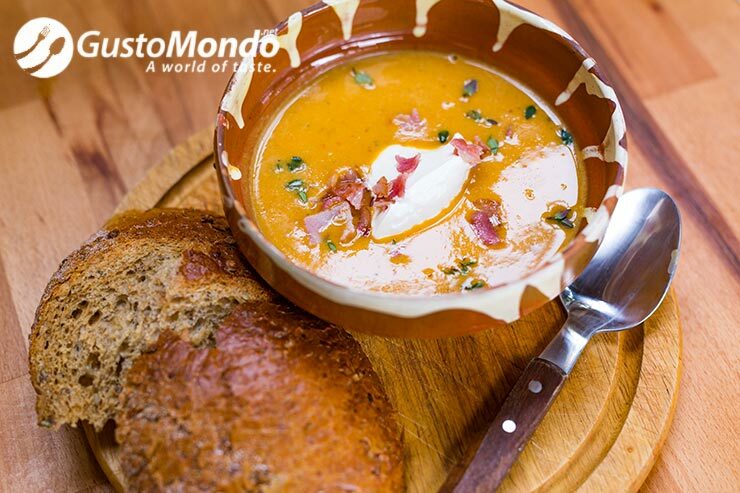 Although it will take a bit of time to roast the vegetables, this roasted butternut squash soup is totally worth it. Crispy bacon adds flavour and texture, but it’s optional really if you want a vegetarian dish. 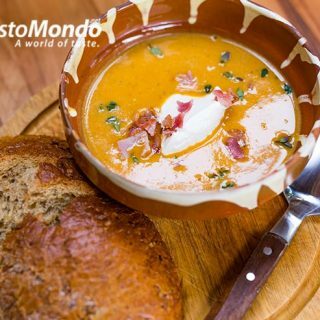 See the short video below (only 2 minutes and 30 seconds) and make the most of the pumpkin season with this simple and easy soup recipe. Simply cut the butternut squash into slices, cut the peppers, onion and garlic in halves. Place on a roasting tray and season with salt and pepper. Add some thyme and olive oil. Bake in the oven for 45 minutes at 200C. The vegetables and the squash will soften and caramelise a bit, making them much tastier, and at the same time easy to clean and peel. Cover the peeled vegetables with one liter of water or stock (chicken would be fine) and boil for 10 minutes. Blend as fine or coarse as you wish, and for a finer texture the soup can also be strained through a fine sieve. Stir in one spoon of sour cream or creme fraiche. Season one last time with salt and pepper. Crisp up the bacon and cut into pieces, sprinkle on top of the soup together with some thyme and maybe a drop of olive oil. Healthiest cream of mushroom soup with girolles. Spanish garlic soup. Sopa de ajo. « Best braised brisket with dark beer and wild mushrooms. Marinated overnight.